This fall has come to be something of a strange time in terms of movie-going as I was supposed to be attending the Toronto International Film Festival this week, but due to some unfortunate circumstances I wasn't able to make the trip. 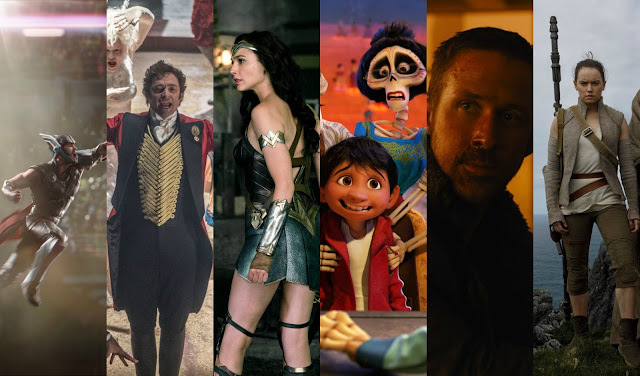 And so, in lieu of seeing and reviewing some of the big prestige pictures set to arrive this fall I decided to highlight some of the films I was most excited to see for the remainder of 2017. It's been a fairly dry year thus far with only a handful or so of exceptional films some of which include a rather stand-out year for super-hero films with Logan, Guardians of the Galaxy Vol. 2, and Wonder Woman all doing stellar jobs of sticking with me while Spider-Man: Homecoming was a ton of fun if not necessarily great. Still, I know plenty of people who would disagree with me on that point so I can only hope this spells good things for Thor: Ragnarok and Justice League come November. That said, given I was anticipating going to TIFF this year much of what makes up my most anticipated for the remainder of the year are those that I would have been seeing this week with others that I might have had the chance to see falling by the wayside in the wake of mapping out the final three months of the year, but that I'm still very much excited to see. For example, while titles such as Hostiles, Call Me By Your Name, The Shape of Water, and Downsizing are all films I look forward to for one reason or another they didn't make my final cut (though, if the word out of this year's collection of film festivals is to be believed I'll grimly regret leaving Call Me By Your Name out of this list). Not to be left out, there are certainly other blockbusters that I wasn't able to include on the list either that I'm anxious to lay my eyes upon including Pitch Perfect 3, Jumanji: Welcome to the Jungle, as well as the latest works from the likes of Steven Spielberg (The Post) and Ridley Scott (All the Money in the World). All of that said, let's get into the movies that I am excited to see and see which did and didn't make the cut.